Since 2003, Scott has been a Computer Crime Specialist with the National White Collar Crime Center. In that position, Scott has been actively involved in establishing, creating and updating much of the content in the computer forensic courses available through the National White Collar Crime Center (NW3C). The creation of the content involved extensive research, and testing of the content of the classes, in many forensic and technical disciplines. Prior to his tenure at the NW3C, Scott was an investigator for the Washington State Office of the Attorney General, in the Criminal Division, and the Consumer Protection Division. In that capacity, he was the Computer Forensic examiner for the Washington State Office of the Attorney General. His duties included seizing and examining electronic evidence, conducting investigations into high tech thefts and frauds, providing technical assistance to other state and local law enforcement agencies, and providing technical expertise in the drafting of laws that were presented to the Washington State legislature. Scott was a Tax Auditor for the Washington State Department of Labor and Industries (DLI), before beginning his career as a criminal investigator. During his time as a DLI Tax Auditor, Scott created the prototype of the computerize field auditing program now in use by the DLI. Along with the development of the prototype program, Scott was responsible for creating and implementing the policies and procedures for the programs use. Scott completed his IACIS certification in 1996. 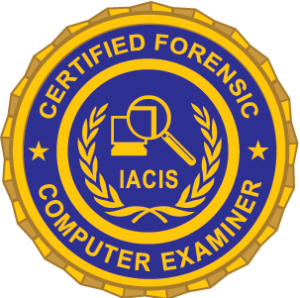 In 1999 he earned the Novell and Windows NT Network and Forensics Seizure and Examination of Linux Operating System certifications from IACIS. In May 2006, he completed the LINUX Forensic Course offered by the California Department of Justice. Scott earned his CPA in 1987, retiring his CPA certification in 2003. He has NET+ and A+ certifications as well. Scott began working as a coach for the IACIS certification program in 1997. In the 18 years Scott has been part of the certification process, he has coached many fledgling forensic examiners, helped create certification problems, certification test reviewer and served as a test examiner. Scott has been a speaker at many conferences, including conference sponsored by ICAC, HTCIA, DCC, NAAG, NASAA, NPFTF and others. Scott is currently on the steering committee for NIST’s Computer Forensic Tool Testing Program.